The 2019 season will mark the fourteenth intercollegiate soccer season overall as a head coach for Evan Michael Camperell, as well as his second season at the helm of the Paris Junior College soccer program. At the intercollegiate level Camperell has served as a head soccer coach within the JUCO, NAIA, NCAA (D3), and NCAA (D2) levels. Most recently Camperell served as the head women’s soccer coach at Norco College, located within southwest Riverside, Calif. and part of the California Community College Athletic Association. Camperell also taught a variety of physical education and health classes at the College. Prior to Norco College Camperell served as the Director of Soccer (head men’s & women’s soccer coach) at Saint Katherine College in San Marcos, Calif., which is a member of the National Christian College Athletic Association. The women’s soccer program there is the third intercollegiate soccer program he has started. Previously Camperell served as the head women’s soccer coach at Lincoln University near Philadelphia Penn. In 2014, the women’s soccer team finished the fall season with the second best winning percentage in the history of the program (NCAA D2 era). The team was also honored in both 2014 and 2015 by the National Soccer Coaches Association of America with the “College Team Academic Award.” In 2015 the program was a recipient of the National Soccer Coaches Association of America “Team Ethics & Sportsmanship Award” (Gold). The second intercollegiate soccer program Camperell started was the MiraCosta College men’s program in Oceanside, Calif. He served there from 2007 to 2010, also teaching physical education and health classes. Prior to 2006, Camperell served as the head women’s soccer coach and as a movement arts (physical education) faculty member for one year at Eastern Nazarene College located in Quincy, Mass. Before his stint at Eastern Nazarene College, Camperell served as the head men’s & women’s soccer coach at Alliant International University-San Diego from 2004-2006. In addition to his coaching duties at AIU, Camperell also served as the Intramurals Director. Just before coming to Alliant International University, Camperell served at the University of the Southwest in Hobbs, N.M. in 2003. 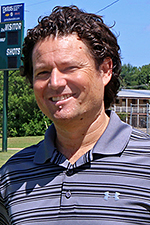 At Southwest, Camperell served as the head men’s soccer coach, founding the program. Coach Camperell also served as a physical education and health faculty member at the University. Camperell is a native of North San Diego, Calif. He played at Palomar Community College in San Marcos, Calif. where the team captured its fourth consecutive Pacific Coast Conference Championship. After his freshman and sophomore years, he transferred to play at the Southern California Intercollegiate Athletic Conference power-house University of Redlands in Redlands, Calif.
Camperell earned his associate of arts degree from Palomar Community College, his bachelor’s degree in psychology from the University of Redlands, and his master’s degree in physical education from Azusa Pacific University. He also spent time studying within the kinesiology department at San Diego State University. He holds two U.S.S.F. soccer coaching licenses and an APEX Fitness personal trainer certification.